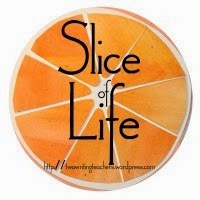 You can write a slice for the Two Writing Teachers community today. Join us now at the beginning of 2016. It's always good to read what everyone shares. Thank you Stacey, Tara, Anna, Betsy, Dana, Kathleen, Beth, and Deb. Happy New Year. I hope if you've retuned to work that the week has started beautifully. I'm posting two places today because a big slice of my whole life, even when some dear family member or another read to me before I could read, is reading. I spent many summers reading book after book, in the early years mostly checked out from a bookmobile. I read avidly through high school and college, early marriage, then added reading to my children. When I taught, I read to and with my students, and that has never stopped. Carrie Gelson of There's A Book for That and Maria Selke of Maria's Melange started some of us down the path of giving love to all the books that came before, the ones we have on shelves, but still haven't read! 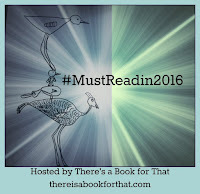 There is a small group of us who began sharing lists titled #MustReadIn2014. You can view that list if you click on the title on the bar above. I've read 13 of the 26 I listed. Someday I may read them all, but maybe not. For whatever reason, I haven't taken the time for them. In my list for 2015, hashtag #mustreadin2015 (see above also) I read 10 of 21! I have moved a few of the books from previous lists to this one! Thanks for the nudge to carry on, Carrie! These are not all the books I'll read this year. I'll also read picture books, new middle and YA books, and ones for adults too. I want to read more books by diverse authors, too. But these are books I don't want to sit too much longer on the shelf! Perhaps you'll discover one or more that you've forgotten you want to read, too! from previous lists - Still want to read! I'm just beginning my reading as a Round Two Judge for the Cybils Awards. You can find all the finalists HERE! This includes three verse novels, one anthology and three poetry collections by one author. I do love to read, and I enjoy and celebrate authors and their expertise. I think it's why I love writing, too, and loved reading with students, and helping them become better writers. Hmm, I have read a bunch from your list but also see some that are new to me. I may do a #mustreadin2016 post too as I have enjoyed seeing all the lists. I love your ending quote. Terrific, hope you find some good books here to read! I am always on the lookout for new titles, so .. thank you for sharing. You're welcome, Kevin. Hope you find a few that will be great reads! I love looking at everyone's lists. They always add titles and authors to my reading wish list. Not a big fan of reading challenges or must reads though, the guilt part of not getting things done nags me too much. Totally at awe with people who make reading plans and achieve goals. Happy Reading! Thanks, Terje, each person needs to do what feels right. Hope you find a few titles that interest you! Great quote Linda. Up early and ready to read all of the slices. Happy Reading to you. Thanks, Carol, and the same to you! I am a reading lunatic as well and stalk Carrie Gelson because she knows everything about the best books. Wolf Wilder is top of my list. Rooftops was amazing. Thanks for this list...and your thoughts. Connecting with this group adds to my list often, and I'm happy to see books they love, then read and love them, too. Thanks, Kimberley. The sad part is that I own all those books, but somehow I've never made them a priority. Terrific that you've read them, Irene! Happy Reading this year. Thanks for the Anna Quindlen quote because now I am going to get the book - I have read a lot of her work but not this one. It is a wonderful book, and I agree that Anna Quindlen's books are always good. Enjoy! As I look at the list of books on my Kindle and the stack of books around my chair your post is inspiring me to get busy and read. I just finished a book called Taboo, A CSI Reilly Steel Thriller (which I enjoyed) and now I am reading Rick Riordan's Magnus Chase and the Gods of Asgard - The Sword of Summer. I'll make note of Taboo for my son, who loves thrillers! I do too, but don't have much time to read them. Rick Riordan's books hold so much to learn in the plots. Glad to inspire, and Happy Reading! Thanks, Dana, enjoy reading whatever books you choose this year. Hope you found a few titles here! I need to make my #MustReadin2016 list this week. I'll have to move some titles from my previous lists to this year again. Or maybe it's time to let them go. I'll have to figure that out! Thanks for sharing your list! I let some go, too, Holly. They sit on my shelf, & somehow I never choose them. I'm excited about the coming year, catching up on some titles, but reading new ones, too. Yes, thanks Linda for some book ideas! Now that I am retired I have been devouring books . . . so nice to have the time ;-) Happy New Year! Thanks, Lynn, yes I do have more reading time, but my life seems to fill up very fast, too. Hope you enjoy some of these books, too. Love this idea! Quiet is on my list as well. Thank you for stopping by my blog and sharing your story --it meant a lot to me. I will remember your story -- and remember I know her. I am glad that it meant something good to you, Clare. I know it is hard, and my thoughts will be with you. We are having fun with our "must read" lists! All American Boys is definitely on my 2016 to read list; I did love Anne Tyler's book - such a wise and gentle read. I bought it a long time ago, but each time I reached for it, another book took its place. I love her books, and will read it soon! Thanks, Tara. All American Boys sounds good, too! I think of myself as a reader, and yet I wonder what I would find if I tallied all my unread books? Yikes! I bet this does motivate one to read. I have many professional books that I have purchased but not cracked open. I have a dear friend (Carol) who always sends me boxes of books she read and loved...I don't read as fast as she does! I have books unread when the next box arrives. You have given me food for thought! Happy New Year, Linda! What a lovely friend to send you books, but it does take time I know, and there are so many wonderful ones appearing! Thanks, Maureen! I always loving seeing what other people are reading! Definitely a few titles here I need to check out. I don't envy you, having to choose one book from seven that are absolutely terrific! It was hard to get it from 48 to 7! There are some I loved on that list before the seven. I don't know how you all did it either, Carol. I've read some, but none of the verse novels, will start soon! I still need to finish my list and post my Must Read in 2016. Reading everyone's list only adds to mine, but sharing our reading lives is so much fun! I know what you mean about adding, but this time I've just started a 2nd list so I will remember some. I'll look for your list, Leigh Anne! Terrific, I will try, after the poetry, to pick it up next! Thanks, Jennifer! Happy New Year Linda. Your post is a treasure trove of titles I want to put on hold at the library or add to my Amazon shopping cart. I so admire your enduring dedication to literacy and our profession. I hope you discover a few titles that you'll love, Lisa. Remember these are for me to read, still. But they have been so loved by many others! Thanks, & Happy New Year to you, too! I love looking at your list and the thing I've noticed this year is a relaxed reporting (no guilt if you haven't read all the books), so I may actually join this group. My shelves are filled with unread books. How to decide which ones to put on this year's list? I loved Rooftoppers and Stella by Starlight, I liked the Meaning of Maggie too. Happy reading, my friend, in this new year! I wish you would join in, Ramona. Did you read Carrie's post, about check in dates, etc.? And yes, few managed to read all the books in their lists, but it is lots of fun to read what everyone is reading. Thanks for your recommendations. I've heard many good things about those books! Happy Reading to you! If you lived down the street, we could share books! PS Thank you for spreading your sunshine to so many so often! Thanks, Loralee! Glad you like the list & the quote! I really enjoyed Stella by Starlight, All American Boys and the Sheinkin book. You have a nice mix of titles. I think you have a wonderful year of reading ahead of you. Thanks Crystal, I'm surprised that I haven't read the Sheinkin book. I do love his books. Certainly the others will be soon. Thank you!